209. Hanukkah Festival of Lights Celebrations. Electric Hanukkah Chanukiah or Menorah. Copyright ©2011 Ruth Lor Malloy. I’ve been thinking that Hanukkah is strictly a family affair. 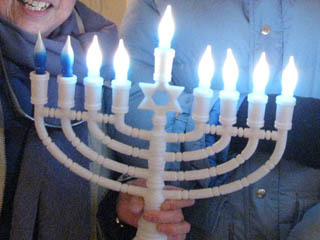 Each evening of the eight-day event, Jewish families light one more candle in a chanukiah or menorah, eat traditional food, and exchange gifts. Recently, I’ve found a couple places where anyone can experience the event. None of these are free as they involve dinner with special foods like latkes or potato pancakes. The celebration at the Temple Har Zion costs $10 for adults, $6 for children. It’s on Friday, December 23 and it’s at 7360 Bayview in Thornhill at 5:30pm. Tel. 905-889-1809. I found this one in : http://www.nowtoronto.com/news/daily_events.cfm. Downtown, there’s one this evening, Thursday, Dec. 22 at the Miles Nadal Jewish Community Centre. Unfortunately, it’s completely booked but do keep it in mind for next year. I hope to tell you what happens. Do let us know your Hanukkah experiences. Hanukkah or Chanukah commemorates the re-dedication of the Second Temple in Jerusalem in the second century B.C. It is also known as the Festival of Lights. It ends this year on December 28. The information above will be updated. Hanukkah in 2017 is December 12 to 20. Look for that period’s blog at Torontomulticulturalcalendar.com. Better still, subscribe to its newsletter.